A recent reprinting of Aurelia data sheets is like a breath of fresh air. 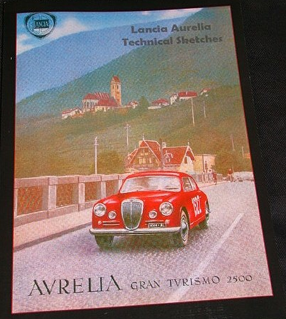 James Steerman, a noted Lancista, has been collecting the factory data sheets for the Aurelia and recently kindly issued a reprint of these hard-to-find items. These sheets were the way the factory communicate their service ideas to the field, and were in place of a workshop manual. Finding these sheets is never easy. They were issued typically in numerical sequence, in Italian and also sometimes in other languages. They date from about the early 1950’s all the way into the 1960’s. Their numbering system is elusive, and their issuance was probably on an as-needed basis. To my knowledge, no one has a complete run of these – and this collection is timely. The last list I knew of was compiled by Yale Braunstein in the 1970’s. James has gone beyond this and found some previously unknown sheets. The compilation is a digital printed, short run, nicely printed, and worth having for reference. The scans are good, the printing nice (the resolution is just great). My quibbles are probably academic – a table of contents would be useful, and more narrative on what guided his selection. Pricing probably reflects the time it took, but…. As James ironically predicted, no sooner can these be published than new information will surface. And that isn’t all bad. Thanks for bringing this forth. Is-it possible to find again this book to day? if yes, can you send me the address? Excellent though Steerman’s book is, it does not include all the Data Sheets (AST Sketches) concerning the Aurelias, although it is very good. I can supply a list of the titles I know of, but have the feeling that there were others that have not surfaced yet.